Nathan Chen performs his Short Program at the 2019 Geico U.S. National Figure Skating Championships. 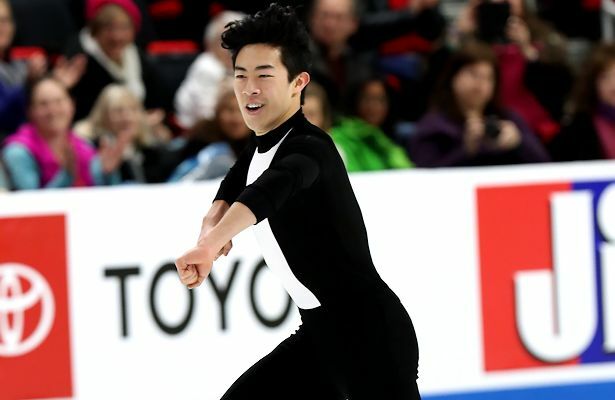 Two-time reigning U.S. champion Nathan Chen began defense of his title with 113.42 points to lead the men’s short program at the 2019 Geico U.S. National Figure Skating Championships on Saturday in Detroit, Mich.
Skating to “Caravan” by Boston Brass, the world champion opened with a strong triple Axel followed by a solid quad flip. He later earned a whopping 15.07 points alone for a quad toe-triple toe that was executed in the second half of the program. The 19-year-old also received level 4s on all three of his spins and step sequence, as well as high grades of execution (GOE). Chen won both Skate America and the Internationaux de France en route to the 2018-19 Grand Prix Final gold medal this autumn, all while juggling his freshman year at Yale University. In second after the short program is Jason Brown with 100.52 points. Returning from a disappointing sixth at Nationals in 2018, the 2015 champion delivered a triple flip, triple Axel, and triple Lutz-triple to in his routine to “Love Is A B…” The skater posted four level 4s with high GOEs, mostly +4 and +5, on all elements. Vincent Zhou is right on the heels of Brown with 100.25 points. The 18-year-old current bronze medalist skated to “Exogenesis Symphony Part III” by Muse, and despite under-rotating his opening quad Lutz on his first combination jump (with a triple toe), rallied back with a strong quad Salchow and triple Axel. He also was awarded level 4 on all spins and footwork. Tomoki Hiwatashi is fourth after an 84.05-point short program to “Cry Me The River.” While he fought for the landing of a triple Axel, he cleanly landed a triple flip and triple Lutz-triple toeloop combination.The the 2016 U.S. junior champion also executed two level 4 spins and step sequence. Aleksei Krasnozhan is in fifth with 82.53 points, while Timothy Dolensky is sixth with 81.10.